Dundee reached the quarter-finals of the Co-operative Insurance Cup with a thrilling extra-time win over Aberdeen. Eddie Malone headed Jocky Scott's men in front in 38 minutes before Craig Forsyth blasted a second from close range at the start of the second half. Michael Paton rescued Mark McGhee's side with two goals, the latter a shot from the edge of the box in the 88th minute to take the tie into extra-time. 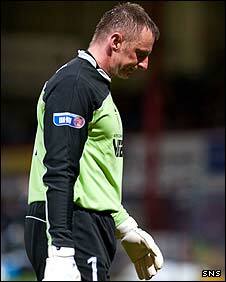 However, a blunder by Jamie Langfield let Leigh Griffiths in for the winner. The Dons were without injured defender Zander Diamond and Sone Aluko, who is on international duty with the Nigeria squad at the Under-20 World Cup. Rab Douglas made his first start of the season for Dundee, replacing Tony Bullock, but the latter, sent off on Saturday against Queen of the South, was back between the sticks when the luckless Douglas was forced to leave the pitch through the recurrence of his injury. Peter Pawlett came on as a ninth-minute substitute to replace former Parma defender Davide Grassi, who had suffered a head cut. And two shots from the young sub forced saves in the 22nd and 46th minutes from Douglas and Bullock respectively. Malone's first-half opener gave Dons goalie Langfield no chance, as he directed Gary Harkins' curling free-kick low to the far post. Colin McMenamin could have heaped the pressure on McGhee's Dons at the start of the second half, but he failed to hit the net after rounding Langfield. But the striker soon made amends when he set up 20-year-old midfielder Forsyth, who slammed the ball high into the net from close range. Aberdeen pulled one back from a close-range Paton effort with half an hour of the match remaining, Charlie Mulgrew the provider. And the drama increased when Paton scored from the edge of the area in the 88th minute to take the game into extra-time. Going into the additional half hour, Aberdeen would have been many fans' favourites to go on and book a place in the quarter-finals. But at the end of the first period of extra-time a Langfield howler allowed former Livingston striker Griffiths in to gift the Dee their third goal of the evening. 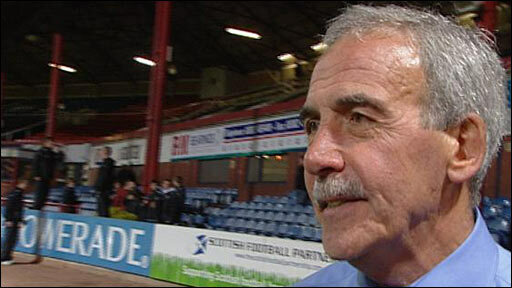 Dundee manager Jocky Scott: "I thought we did very well other than the first half, where I thought we looked a bit tentative and we allowed them to influence the game. "It ends up a narrow scoreline but I thought we deserved to win. We may not be a Premier League team, but we showed this team what we could do. "I thought we were the better side. At times we passed it very well. That's what I want them to do week in, week out. We have the quality to do that. "We're delighted and we look forward to the next round." Aberdeen manager Mark McGhee: "I thought our defending at times was shambolic: our concentration, getting too tight to people - it was poor. "We have lost a game that I don't think we necessarily should have lost. 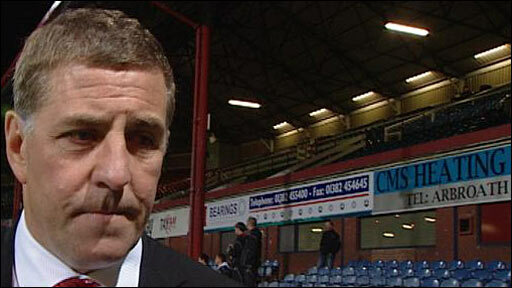 "I'm not taking anything away from them (Dundee), but I think we can defend better than we did. "We are playing a system that suits the players but we didn't do well enough. "It's the same group that will go to Ibrox and we will have to defend better, but it's going to be a longer process than simply fixing it before Saturday." 120:00+1:07 The whistle goes and the game ends after extra time. 120:00+0:11 The offside flag is raised against Leigh Griffiths. Jamie Langfield takes the indirect free kick. 119:36 Christopher Maguire is caught offside. Tony Bullock takes the free kick. 117:57 Gary McDonald takes a shot. Gary MacKenzie gets a block in. Charlie Mulgrew takes the inswinging corner, David Cowan makes a clearance. 117:29 Free kick awarded for a foul by Brian Kerr on Mark Kerr. Jerel Ifil restarts play with the free kick. 113:20 Lee Miller produces a right-footed shot from just outside the area that goes harmlessly over the target. 111:01 The ball is sent over by Charlie Mulgrew, save made by Tony Bullock. 109:47 Charlie Mulgrew delivers the ball, Gary MacKenzie manages to make a clearance. 109:13 Mark Kerr fouled by Craig Forsyth, the ref awards a free kick. Jamie Langfield takes the free kick. 108:50 Eric Paton produces a cross, Lee Miller manages to make a clearance. 108:24 Corner taken right-footed by Gary Harkins from the left by-line, clearance by Jerel Ifil. 108:15 Leigh Griffiths sends in a cross, clearance made by Andrew Considine. 107:25 Leigh Griffiths has a header from deep inside the six-yard box and clears the crossbar. 106:37 Andrew Considine concedes a free kick for a foul on Leigh Griffiths. Direct free kick taken by Eddie Malone. 105:01 The referee blows his whistle to start the second half of extra time. 105:00+2:16 Corner from right by-line taken by Charlie Mulgrew. 104:01 Assist by Eddie Malone. 104:01 GOAL - Leigh Griffiths:Dundee 3 - 2 Aberdeen Leigh Griffiths scores a goal from the edge of the penalty area low into the middle of the goal. Dundee 3-2 Aberdeen. 103:18 Corner from the left by-line taken by Gary Harkins, clearance made by Jerel Ifil. 102:34 Effort from 18 yards by Michael Paton. Tony Bullock gets a block in. 101:48 Shot on goal by Craig Forsyth from just inside the area goes over the target. 100:32 Patrick Clarke fouled by Andrew Considine, the ref awards a free kick. Free kick crossed right-footed by Gary Harkins. 99:37 Patrick Clarke takes a shot from just inside the penalty box which clears the bar. 99:00 Corner taken by Charlie Mulgrew played to the near post, clearance by Eddie Malone. 98:47 Corner taken by Charlie Mulgrew played to the near post, clearance made by Maros Klimpl. 98:24 Inswinging corner taken by Charlie Mulgrew from the right by-line played to the near post, clearance made by Maros Klimpl. 97:48 Substitution Patrick Clarke comes on in place of Colin McMenamin. 97:15 The ball is delivered by Michael Paton, Effort from deep inside the area by Lee Miller misses to the left of the target. 96:46 Gary Harkins takes a shot. Charlie Mulgrew gets a block in. 96:20 Leigh Griffiths delivers the ball, save by Jamie Langfield. 94:06 Foul by Christopher Maguire on David Cowan, free kick awarded. Direct free kick taken by Tony Bullock. 92:23 Centre by Craig Forsyth, save by Jamie Langfield. 91:55 Free kick awarded for a foul by Christopher Maguire on Maros Klimpl. Tony Bullock takes the direct free kick. 90:55 The ball is crossed by Charlie Mulgrew, Gary MacKenzie makes a clearance. 90:00+2:40 The whistle goes for the end of normal time. 90:00+2:04 Richard Foster crosses the ball, clearance made by David Cowan. 90:00+1:06 The ball is crossed by Lee Miller, Effort on goal by Charlie Mulgrew from just outside the penalty area goes harmlessly over the target. 89:34 Mark Kerr takes a shot. Save by Tony Bullock. 87:49 Assist by Christopher Maguire. 87:49 GOAL - Michael Paton:Dundee 2 - 2 Aberdeen Goal scored by Michael Paton from the edge of the area to the bottom left corner of the goal. Dundee 2-2 Aberdeen. 86:42 Shot from close range by Christopher Maguire misses to the right of the target. 86:17 Christopher Maguire takes a shot. Blocked by David Cowan. 85:01 Leigh Griffiths delivers the ball, save by Jamie Langfield. 84:17 Christopher Maguire takes a shot. David Cowan gets a block in. 84:06 Centre by Richard Foster, Tony Bullock makes a save. 82:47 Centre by Richard Foster, Eddie Malone manages to make a clearance. 81:34 Effort from outside the penalty box by Michael Paton goes wide right of the target. 81:18 Gary Harkins sends in a cross, clearance by Jerel Ifil. 78:46 Gary Harkins takes a outswinging corner from the right by-line played to the near post, Colin McMenamin has a headed effort at goal from close in which goes wide right of the goal. 78:35 David Cowan crosses the ball, Charlie Mulgrew gets a block in. 75:06 Leigh Griffiths is flagged offside by the assistant referee. Jamie Langfield restarts play with the free kick. Correction - 74:49 Michael Paton handles the ball and concedes a free kick. Eric Paton takes the free kick. 74:49 Handball by Michael Paton. Eric Paton takes the free kick. 74:18 The ball is delivered by David Cowan. 73:01 Substitution Sean Higgins goes off and Leigh Griffiths comes on. 73:01 Jamie Langfield takes the direct free kick. 73:01 Booking The referee cautions Maros Klimpl for unsporting behaviour. 72:45 Free kick awarded for an unfair challenge on Mark Kerr by Maros Klimpl. 72:32 Craig Forsyth delivers the ball, Andrew Considine makes a clearance. 71:59 The ball is delivered by Christopher Maguire, Maros Klimpl makes a clearance. 71:16 The ball is delivered by Charlie Mulgrew, save by Tony Bullock. 69:52 Eric Paton produces a cross, save by Jamie Langfield. 69:21 Inswinging corner taken from the right by-line by Craig Forsyth, Richard Foster makes a clearance. 69:02 Colin McMenamin takes a shot. Jerel Ifil gets a block in. 68:18 Andrew Considine challenges Sean Higgins unfairly and gives away a free kick. The free kick is swung in right-footed by Gary Harkins, save by Jamie Langfield. 68:10 Gary McDonald sends in a cross, Eric Paton manages to make a clearance. 67:47 Free kick awarded for a foul by Colin McMenamin on Peter Pawlett. Jamie Langfield takes the direct free kick. 62:35 Free kick taken by Charlie Mulgrew. 62:35 Booking Peter Pawlett is shown a yellow card for dissent. 62:24 Assist on the goal came from Charlie Mulgrew. 62:24 GOAL - Michael Paton:Dundee 2 - 1 Aberdeen Goal scored by Michael Paton from inside the six-yard box to the bottom right corner of the goal. Dundee 2-1 Aberdeen. 62:19 David Cowan challenges Peter Pawlett unfairly and gives away a free kick. 61:24 Free kick awarded for an unfair challenge on Christopher Maguire by Maros Klimpl. The free kick is delivered left-footed by Charlie Mulgrew from left channel, David Cowan makes a clearance. 60:53 Effort from the edge of the penalty box by Sean Higgins goes wide of the right-hand upright. 59:09 The ball is sent over by Craig Forsyth. 57:44 Gary MacKenzie challenges Lee Miller unfairly and gives away a free kick. The free kick is delivered right-footed by Richard Foster from right wing, clearance made by Charlie Mulgrew. 56:46 Substitution Michael Paton on for Darren Mackie. 56:46 Substitution Christopher Maguire on for Jonathan Crawford. 54:59 Assist by Colin McMenamin. 54:59 GOAL - Craig Forsyth:Dundee 2 - 0 Aberdeen Craig Forsyth fires in a goal from close in to the top left corner of the goal. Dundee 2-0 Aberdeen. 53:51 Darren Mackie is flagged offside by the assistant referee. Tony Bullock takes the free kick. 53:19 Centre by Charlie Mulgrew, Maros Klimpl manages to make a clearance. 52:08 Jerel Ifil concedes a free kick for a foul on Eddie Malone. Tony Bullock restarts play with the free kick. 50:11 Free kick awarded for an unfair challenge on Lee Miller by Maros Klimpl. Direct free kick taken by Charlie Mulgrew. 49:40 Effort from inside the six-yard box by Colin McMenamin goes wide right of the target. 49:18 Shot by Sean Higgins from 25 yards. Save made by Jamie Langfield. 47:13 Colin McMenamin fouled by Jerel Ifil, the ref awards a free kick. Sean Higgins has a direct shot on goal from the free kick. 46:49 Free kick awarded for a foul by Darren Mackie on David Cowan. Tony Bullock restarts play with the free kick. 46:22 Colin McMenamin takes a shot. Andrew Considine gets a block in. 45:58 A cross is delivered by Eddie Malone, save by Jamie Langfield. 45:00+2:11 The referee blows for half time. 45:00+1:46 Gary MacKenzie gives away a free kick for an unfair challenge on Lee Miller. Mark Kerr takes the direct free kick. 45:00+0:36 Unfair challenge on Colin McMenamin by Andrew Considine results in a free kick. The ball is delivered by Gary Harkins, Sean Higgins produces a header from deep inside the six-yard box that clears the bar. 44:42 Lee Miller produces a right-footed shot from close range which goes wide of the right-hand post. 41:49 The ball is crossed by Jonathan Crawford, Gary MacKenzie makes a clearance. 41:29 Jerel Ifil delivers the ball, clearance by Gary MacKenzie. 41:21 The ball is crossed by Charlie Mulgrew, clearance by Eddie Malone. 40:46 Unfair challenge on Peter Pawlett by Maros Klimpl results in a free kick. Direct free kick taken by Charlie Mulgrew. 39:00 Assist by Gary Harkins. 39:00 GOAL - Edward Malone:Dundee 1 - 0 Aberdeen Eddie Malone scores a headed goal from inside the six-yard box. Dundee 1-0 Aberdeen. 36:30 The ball is sent over by Eddie Malone. 36:08 A cross is delivered by Eric Paton, Jerel Ifil makes a clearance. 35:34 Mark Kerr challenges Sean Higgins unfairly and gives away a free kick. Eddie Malone restarts play with the free kick. 35:19 The ball is delivered by Lee Miller, clearance made by Gary MacKenzie. 31:48 Free kick awarded for an unfair challenge on Peter Pawlett by David Cowan. Free kick crossed right-footed by Peter Pawlett from left wing. 29:57 Foul by Peter Pawlett on Maros Klimpl, free kick awarded. Free kick taken by Tony Bullock. 28:43 Colin McMenamin is ruled offside. Indirect free kick taken by Jamie Langfield. 27:55 Free kick awarded for a foul by Gary Harkins on Andrew Considine. Jamie Langfield restarts play with the free kick. 25:20 Substitution Tony Bullock is brought on as a substitute for Robert Douglas. 25:14 David Cowan fouled by Lee Miller, the ref awards a free kick. Free kick taken by Tony Bullock. 24:23 Corner taken by Charlie Mulgrew from the right by-line to the near post, Robert Douglas makes a save. 24:12 Richard Foster sends in a cross, David Cowan manages to make a clearance. 23:41 Unfair challenge on Gary McDonald by Gary Harkins results in a free kick. Direct free kick taken by Andrew Considine. 22:26 Corner taken by Gary Harkins from the left by-line, save by Jamie Langfield. 21:41 Maros Klimpl fouled by Lee Miller, the ref awards a free kick. The free kick is swung in right-footed by Brian Kerr. 21:17 Peter Pawlett takes a shot. Save made by Robert Douglas. 20:18 Eric Paton gives away a free kick for an unfair challenge on Lee Miller. Charlie Mulgrew takes the direct free kick. 18:53 A cross is delivered by Jonathan Crawford, Shot from deep inside the area by Lee Miller clears the bar. 17:37 The ball is swung over by Craig Forsyth, save by Jamie Langfield. 17:00 Centre by Colin McMenamin, save by Jamie Langfield. 16:37 The ball is swung over by Gary Harkins, Lee Miller manages to make a clearance. 16:14 Charlie Mulgrew gives away a free kick for an unfair challenge on Gary Harkins. Direct free kick taken by Eric Paton. 15:09 Foul by Lee Miller on Eric Paton, free kick awarded. Robert Douglas restarts play with the free kick. 11:52 Outswinging corner taken by Charlie Mulgrew from the left by-line, save made by Robert Douglas. 11:24 Unfair challenge on Charlie Mulgrew by Sean Higgins results in a free kick. Free kick taken by Jamie Langfield. 10:15 Foul by Sean Higgins on Mark Kerr, free kick awarded. The free kick is swung in left-footed by Charlie Mulgrew. 8:58 Substitution Davide Grassi goes off and Peter Pawlett comes on. Correction - 7:20 The referee blows for offside. Gary MacKenzie restarts play with the free kick. 7:20 Lee Miller is caught offside. Free kick taken by Gary MacKenzie. 6:06 David Cowan challenges Lee Miller unfairly and gives away a free kick. Charlie Mulgrew crosses the ball from the free kick left-footed from left wing. 2:24 Darren Mackie fouled by Gary MacKenzie, the ref awards a free kick. The free kick is swung in left-footed by Richard Foster. 1:14 Shot from just outside the box by Lee Miller goes over the target. 0:15 Corner taken left-footed by Charlie Mulgrew to the near post, clearance by Brian Kerr.